Heavy duty full width acrylic door with a gasket, push-button lock with stainless steel locking slam latch. Stainless steel piano hinge and gas ram door support. 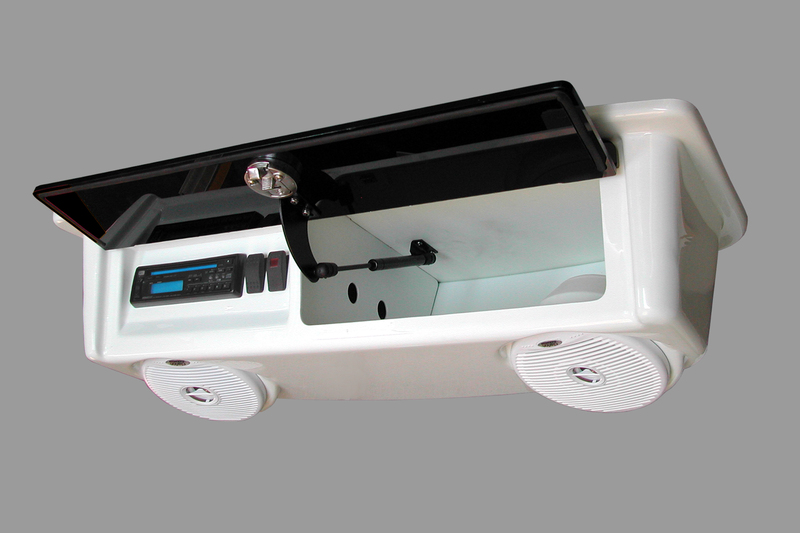 The full-width door covers stereo on the port side with 5/8" clearance for radio bezel and the starboard storage area. Size/Fit: Outside dimensions - 34 5/8"W x 19"D x 7 3/4"H. Inside dimensions - 32 1/2"W x 15"D x 7 1/4"H. Radio mounting area is 10 ½" W x 3 3/8" High (267 x 86 mm) with 1 ¼" (32 mm) clearance for radio bezel behind. Ships in 36x21x14 x 23lb box. Options: Also consider: SSI® Deluxe Overhead Electronics Box with Speaker Locations. We sell ALL SSI® Overhead Electronic Boxes, Tackle Centers, Access Doors, Coolers, etc., so call or email for price on anything you see.